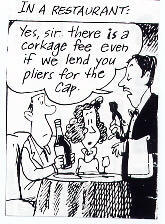 One of my astute readers corrected me when I wrote in the last issue that Bernard Ambroise was the first to use a screw cap in Burgundy. He wrote, “One small correction - Patrice Rion offered some 2002 and 2003 vintage wines with screw caps. Now the importer can choose before bottling which closure he wants. I don’t think Patrice was the first either.” To set the record straight, anyone know who the first was? It may be old news to some, but it still brings a smile to my face. Bonny Doon’s irreverent winemaker, Randall Grahm, staged funerals for the cork in New York City and San Francisco in 2002. Go to www.deathof thecork.com for full coverage and photos.